"I'm one hell of a butler"
The above info came from Ophelia Parkinson, and was edited by yours truly (contact me). The image came from animepaper. 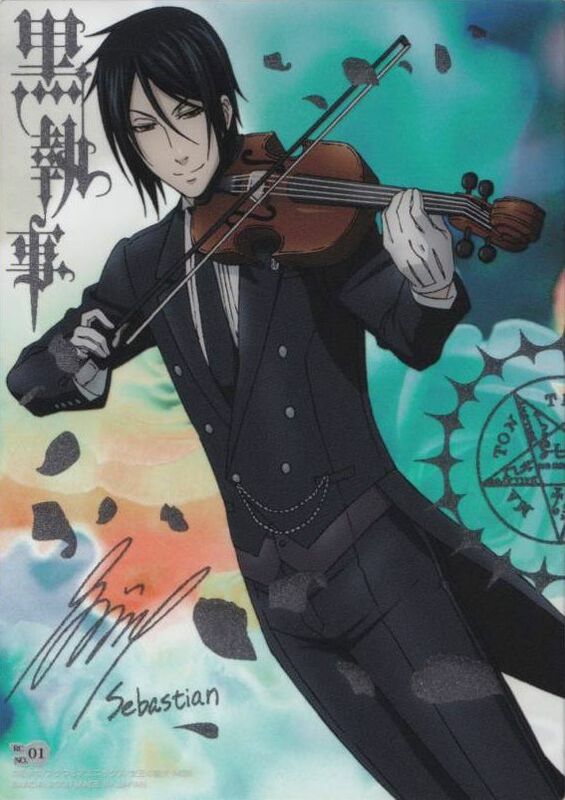 Sebastian Michaelis is a demon butler of the Phantomhive household and loyal to his lord/master, Ciel Phantomhive. Sebastian has a radiant and attractive appeal to both men and women, as suggested in the anime and manga. But don't be deceived by his charming looks, Sebastian has talent and skills beyond the imaginable. In addition to being the Phantomhive family's butler, he is also Ciel Phantomhive's bodyguard. He is highly skilled butler, and can do practically everything, no matter how impossible a task looks. No matter how messed up everything becomes by hands of the other three, Bard, Finian, and Meirin, he always is in time to make everything alright. Then he says that it's only normal as a butler of the Phantomhive family. He can do all this because he's a demon. Sebastian saved Ciel when Ciel was traded as a slave, and made a contract with Ciel, now his young master. He must do everything Ciel wants, because of the contract. But Sebastian gets Ciel's soul. The contract is sealed with a pentacle. Sebastian has it on his left hand and Ciel has it in his right eye. The above description came from Ophelia Parkinson and Kitty van Rossum, and was edited by yours truly (contact me).